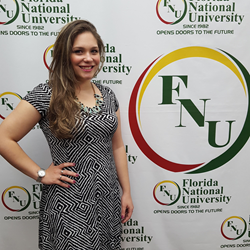 Twenty-four-year-old Cuban native, Luisa Maria De Souza will be graduating from Florida National University’s (FNU) MBA program specializing in Health Services Administration this Spring. After graduation, she will attend Penn State Medical School. De Souza emigrated from Cuba to the United States at the age of 12. This particular turn of events in her life was the catalyst. It is something that she feels is unique to the experience of someone who travels to another country to start their life. The opportunities that the United States provided caused her to thrive. This young scholar continued to excel through her college years. During her time in undergraduate studies she attained a Bachelor of Science in Chemistry, a Bachelor of Science in Biology, a Minor in Philosophy, and a research specialization. After her undergraduate, De Souza applied to medical schools and prepared for her examinations. Ambitiously, she also worked in the U.S. Department of Agriculture for MARS® (the chocolate company) doing research with cacao. She decided that she wished to understand the business end of the medical world to give her application that “extra kick,” as she says. This led her to Florida National University (FNU). Her mother was a speech therapist in Cuba, and De Souza states that she spent time with doctors often due to her poor health in early life. She was under the care of an incredible pediatrician who made her care easier despite the difficult conditions and limited resources that were available at the time in Cuba. She says that all of this inspired her to become the student and future doctor that she is today. She also talked about the sacrifice that comes with success. Penn State was her final choice out of 6 acceptance letters to various other medical schools. Needless to say, she has quite a stellar academic record. For more information about the opportunities available to individuals who wish to attain their own success like Luisa has, please contact FNU’s Admissions Department at (305) 821-3333 for more information or Marketing and Development Specialist, Megan Silva at Msilva(at)fnu(dot)edu or (305) 821-3333 Ext. 1076.